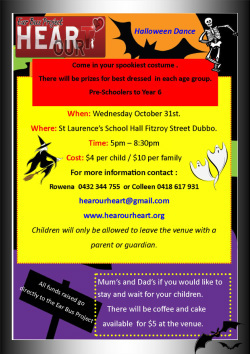 Children from 3-12 years will have a fantastic time playing Halloween games and dancing up a storm. On the scariest afternoon of the year the Ghostly Halloween Dance will excite the ghosts, goblins and witches to come out of the woodwork and shake some booty. There will be prizes for best dressed children in each age category. $4 a child or $10 a family Entry at the door. Parents are more than welcome to stay. There will be coffee and cake available for $5 so stay and catch up with other parents and friends. All funds raised go directly to the Ear Bus. Food and drink available for the kids too. Venue St Laurences School Hall. Fitzroy Street Dubbo. From 5pm to 8:30pm Children do not have to stay for the whole time. Prizes for Best dressed in each age group so get them costumes out.